I am not sure if I should call this a mandala. I see someone on Zazzle who calls her creations synbalas. Others seem to like to call their's kaleidescopes. I am considering symmedra. If anyone has a suggestion, let me know. This is a different approach to the design process, but it is one I will do more with. It is interesting in that I started with the outside ring and worked my way in, which is the opposite of how I usually work the circle designs. Gestation or procrastination or artist's block; it is hard to know. 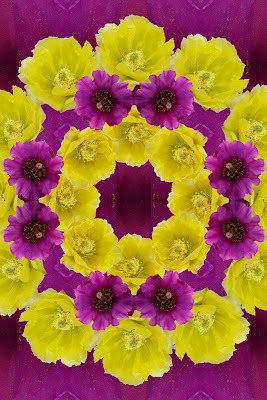 I have intended to revisit my Yellow Prickly Pear/ Jumping Cholla Mandala since finishing it, but nothing had happened. Sometimes, I think we just have to let things gestate and kind of percolate for a while before it is ready to come out. When it finally does, it gives you that aha! feeling; and there is an element of surprise. That star in the center was a wondeful gift, and total accident from my point of view.